In August 2005 WHI was lucky to engage Dr. Cathryn Mellersh BSc PhD, Senior Canine Geneticist at the Animal Health Trust, and Dr. Karin Allenspach, med.Vet. FVH, DECVIM-CA MRCVS, to compile a Seminar. Dr Mellersh spoke on genetics and Dr Allenspach on Protein Losing diseases. 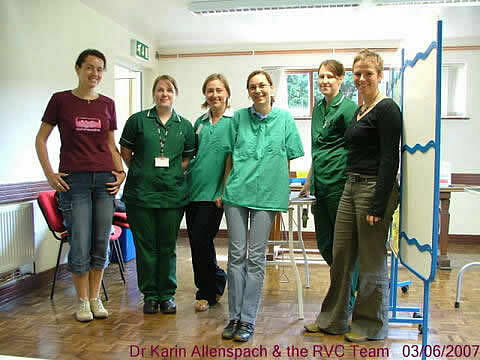 Dr Allenspach had recently started lecturing at the Royal Veterinary College’s, Queen Mother Hospital in Hertfordshire, but prior to her appointment had worked in other countries, including a time with Dr. Shelly Vaden’s team at the University of North Carolina (see Newsletter 11, 2006, for an article on Protein Wasting disease by Dr. Vaden). The seminar was arranged in November 2006 and entitled: ‘Towards a Better Future’. During the seminar Dr. Allenspach talked about a pANCA test, which she had encountered in her work in Switzerland and said that she thought it may be useful to carry out further research to see if it could help in the early detection of protein-losing diseases in Wheatens. WHI held further talks with Dr. Allenspach during the next few months and in February 2007 the project was given the go ahead. The target was to find 200 dogs to participate in the project in approximately two equal groups, one of 2 - 4 years old and the other at older than four years. June 2007 - The pilot blood sampling session was held at Weedon Bec, Northamptonshire, where 30 dogs (mainly from WHI and friends) participated as 'guinea pigs', in order to assess the feasibility of the exercise and in particular the measurement of testing time per dog. July 2007 - The first public sampling took place at Watlington, Oxfordshire on the 1st July, hosted by the SCWT Club of GB. The session was held during the morning before the usual fun day commenced and samples were taken from 36 dogs. July 2007 - WHI were pleased to announce that the ‘Kennel Club Charitable Trust’ had confirmed a grant of £600 specifically to assist in covering the costs involved with the pANCA Research Programme. The grant was used to finance suitable venues for Dr. Allenspach’s RVC Research Team to conduct the testing sessions necessary to obtain the blood samples needed for this project. August 2007 -the third session was held at Weedon Bec again with a total of 48 dogs attending. September 2007 - the fourth session held at Hasland, Derbyshire, where 36 dogs participated. November 2007 - Highworth, Wiltshire, was the venue for the final session where a further 30 dogs were sampled. The final total of 186 dogs was enough, Dr. Allenspach said, to make the Project viable and together with Dr. Barbara Wieland they will produce a scientific report of the findings in due course. 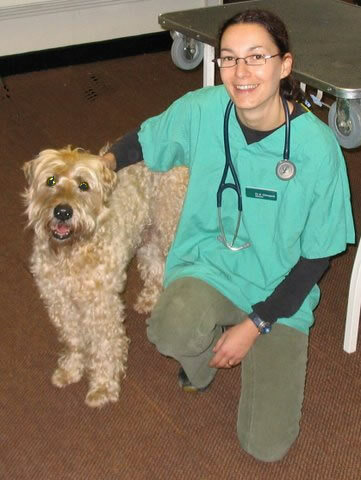 Dr. Karin Allenspach with Kaber, at just over 14 years, the oldest dog to be tested. There would be a continuation follow-up study of a limited number of the initial group of dogs, monitored at six monthly intervals over the next three years.